Ukrainian politicians and agrarian tycoons have announced the intention to build the Ukrainian part of the waterway from Gdansk to Kherson. E40 is the waterway more than 2000 kilometers long, which should pass through the territory of Poland, Belarus and Ukraine. It is planned that the route will connect the Black Sea and the Baltic Sea1. According to the plan, the E40 can become a water connection not only of the Baltic Sea with the Black Sea2. The environmental threats of the project cannot be underestimated. They are particularly noticeable in Ukraine. Dredging and further pollution of the river will put at risk water quality for at least 2/3 of Ukrainian families. The Dnipro provides water not only to water consumers within its basin. It is the main, and in some cases, the only source of water supply for large industrial centers in the south and south-east of Ukraine. The Dnipro-Donbass, North-Crimea and Kakhovsky Channels annually transfer 5-6 million km2 of drainage waters beyond the basin. In general, the Dnipro provides water for 2/3 of the territory of Ukraine, including about 30 million people, 50 large cities and industrial centers, about 10 thousand enterprises, 2,2 thousand rural and more than 1 thousand communal entities, 50 large irrigation systems and 4 nuclear power plants3. The biggest threat is that the planned waterway must go through the entire Chornobyl Exclusion Zone and the Kyiv Reservoir, at the bottom of which was buried radioactive sludge after the Chornobyl accident in 1986. Interference into the bottom of the reservoir as well as into the river beds of the Pripyat or into contaminated lands in Belarus, will release radiation particles into water. Obviously, this water is the main source of drinking water supply for Kyiv, Cherkassy, Kremenchuk, Dnipro, Zaporizhzhia, Kherson, Kakhovka, Kryvyi Rih and many other settlements. No sewage treatment plants can clean water from radiation particles. Because of lack of drainage in reservoirs, the water will stay contaminated for many years. In the context of growing shortage of drinking water resources, there are doubts about profitability of the planned project. In addition, Ukraine is already under threat of new nuclear-related accidents4 and should avoid artificial creation of such threats. 100% of the length of the planned route go through protected areas of international importance. Also, about 80 protected areas are located in the Dnipro aquatorium. The Dnipro Ecological Corridor, part of the Pan-European Ecological Network, that is one of the two main routes of seasonal migration of birds in Europe goes along the Dnipro River. Protection of birds during migration is Ukraine’s responsibility undertaken by signing 6 international agreements. All these and many other circumstances make us state that construction of the E40 waterway in Ukraine and Belarus can be neither safe nor lawful. We will give more details of the threats caused by the construction and legal aspects of the issue in the following publications. Environmental organizations of Belarus have already joined forces to gather information about possible consequences of the construction of the waterway and the change of the channel of the Pripyat River, which is the only river in Belarus that was preserved in its natural state. 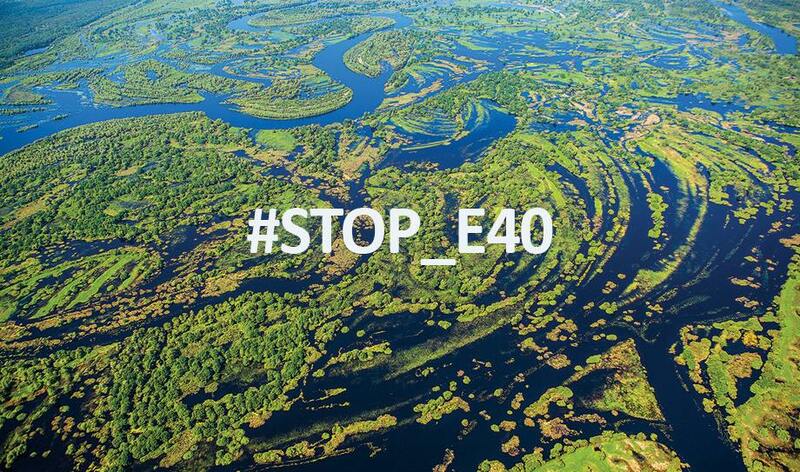 Updated information on the opposition campaign is available at this link http://stope40.org. Major parties interested in building E40 are the Ministry of Transport and Communications of the Republic of Belarus and Belorussian state enterprise “Dnipro-Bug waterway”. They are engaged in exploitation of the Dnipro-Bug water channel in Belarus, and were the initiators of this project. From the Polish side this is the Ministry of Infrastructure and Construction of Poland and the Ministry of Marine and River Shipping5. Until recently, the circle of interests of this project lacked one final link – interested parties on the Ukrainian side. Some clarity brought the X International Investment Forum “Tavria Horizons: Cooperation, Investments, Economic Development”6, held in mid-October 2017 in Kherson. Andriy Gordeyev, head of the regional administration, was the moderator of the key discussion of the forum “Globalization of foreign economic processes through the development of transport and logistics infrastructure and renewal of river shipping”. “We plan to unite the Baltic states, Scandinavia and Asian countries by transport way that passes along the Dnipro,” he said at the forum7. As a result, at the forum there was signed a trilateral agreement on the intentions to construct E40 between Kherson Oblast State Administration, NIBULON company and Homel Regional Executive Committee (video – https://www.facebook.com/100001912884450/videos/1643785052361908/). It is important to emphasize the participation of pro-presidential forces in lobbying this project. The head of the Kherson region and the son of the general director of “NIBULON” company are members of Solidarity. People’s Deputies of Solidarity have already made statements regarding construction of E4010, and some were even posted on the site of the presidential party11. In recent months, the “E40” has begun to appear next to the name of the Ukrainian president. Media reports that the preliminary agreement on the construction of the E40 waterway was concluded by the Presidents of Ukraine Petro Poroshenko and Belarus Oleksandr Lukashenko, during the visit of the latter to Kyiv in July 201712. EPL appeals to the President of Ukraine Petro Poroshenko to act as the guarantor of Ukraine’s national security, compliance with international environmental agreements and basic constitutional rights of Ukrainians for safe and healthy environment. EPL is announcing its intention to monitor the project in terms of compliance with legislation and procedures of public participation in decision making on the feasibility of implementing the project from the point of view of international law, as well as the legislation of Ukraine on environmental impact assessment.